What is DiveCAN® and why should I care? Digital communications are clearly replacing analog communications in computer based devices. As more digital communication becomes integrated into rebreathers, Shearwater went in search of the best digital solution. We looked at basic serial and at higher level serial like HDLC and SDLC as well as microprocessor communication protocols like I2C and SPI. Internet protocols like Ethernet were also considered. We looked at process control protocols like DeviceNet and Modbus. We looked at vehicle protocols like CAN, MilCAN, and NMEA 2000. In the end, the extremely robust CAN protocol won. DiveCAN® is a communications protocol consisting of a physical layer and protocol layers. It is based on the industry standard CAN bus that is widely used for cars, boats, trucks, tanks, and factory networks. It can operate in very electrically noisy environments like a car or semi-trailer. It is suitable for high speed device control like brake-by-wire in cars and turret aiming in tanks. It allows very long cable lengths for surface control applications. It has predictable latency with high traffic, unlike Ethernet. The protocol handler is built into the hardware of the ARM microprocessors that interest us, and the cable level transceiver handlers are inexpensive and used by the millions in the automotive industry meaning there is no concern of discontinuation. Finally, CAN was designed to be a platform that would be used to support a message structure like NMEA 2000 or J1939, and that was exactly what we wanted. The connection is digital and error checked which means it is either received correctly, or the error is detected. In short, it is widely used, simple, and reliable. Networking a diving system makes sense for many of the same reasons that networks are used in other applications. It allows modules to be replaced individually as required. If a handset fails, it can be easily replaced in the field. If new technology comes out, it is relatively easy to just unplug the old device and plug in a new device. This ability to advance along with new technology as it becomes readily available is another key advantage of the DiveCAN® bus. There is another benefit that isn’t strictly part of CAN, but is part of DiveCAN® and many other CAN implementations. It is relatively easy to add two more wires and provide power on the bus. This means that power sources don’t have to be in the same place as power. It also allows for backup power schemes and batteries outside the loop powering devices inside the loop. In life support applications, the modularity can be useful as well. Rather than having a monolithic device that calculates decompression, manages a graphical display, monitors sensors and incorporates other functions, devices can be split out into modules. In the case of Shearwater’s typical DiveCAN® implementation, the module that manages the solenoid is only tasked by reading the sensors and firing the solenoid. It has no complex duties and simpler systems are easier to verify and validate. Since DiveCAN® devices are independent and mutually suspicious, data logging can be expanded. While one of the devices still maintains the typical dive logs, several devices now may keep a log of DiveCAN® messages which give a very complete picture of actual system operation for analysis. Each rebreather has either two independent DiveCAN® buses, or a DiveCAN® bus and some other secondary. 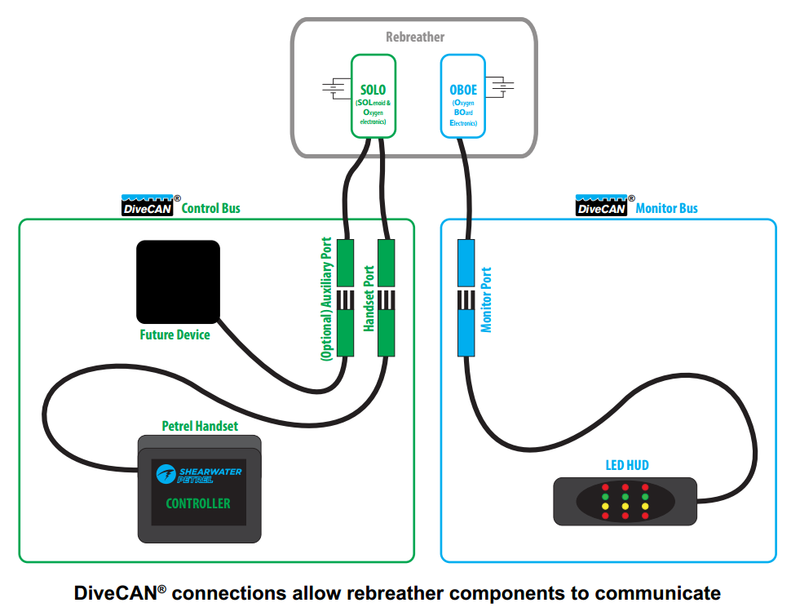 On systems that have two DiveCAN® buses, one DiveCAN® bus is the control bus and the second is the monitor bus. The control handset needs to know what other DiveCAN devices to expect. A missing device could very well mean an unsafe configuration (i.e. trying to start a dive without the solenoid controller communication to the handset). The handset must be configured for the rebreather. This means that the controller is not interchangeable between manufacturers. For example, an rMS system has to know to look for the scrubber temperature sensors and display an error if they aren't present. Although limited to manufacturer approved configurations, this is still more flexible than previous hardwired analog systems. The Monitor bus is more open to reconfiguration. For example, a NERD, the new DiveCAN LED HUD, or a secondary Petrel DiveCAN handset can all be swapped freely and are generic among all manufacturers, except ISC who have their own connector and bus messaging. A common DiveCAN connector is being used by the rEvo, JJ, Hollis, SF2 and O2pitma, so monitor bus devices are compatible. Shearwater announced our intention to offer DiveCAN® systems at DEMA in 2009. We shipped our first DiveCAN® systems in 2012. The DiveCAN® NERD is a recent addition to the list of DiveCAN® devices. Shearwater is now concentrating our rebreather controller research and development on DiveCAN® devices. First and foremost, congratulations for creating such respected company and making available some of the best equipment in the diving industry. Secondly, I am interested in crossing to the dark side of the diving world (rebreathers). I have my eyes set on JJ CCRs and am interested in knowing if you guys build some sort of split cable so I can have a NERD and a Petrel linked to the JJ. I thank you in advance for any help you can give me. Thank for the kind words. You do not need a split cable to connect a NERD 2 and a Petrel 2 at the same time. We build the electronics for JJ CCRs. Because of this, you can get a JJ CCR with a JJ branded Petrel 2 controller and a ppO2 HUD monitor. You can then get a NERD 2 with a DiveCAN cable from one of our dealers and use it to replace the HUD monitor. The NERD 2 will replace all the functions of the HUD plus give you the capabilities of a fully featured NERD 2 unit. Hi, Mark. We have added this as new product request. Please keep in mind this is not a promise to create it and, if we were to do so, we have no timeline as to when this would happen. Cheers. I have Nerd 1 as controller on my rEvo III unit and two revo Dreams…I want to use Petrel 2 as controller and Nerd instead dreams. Question is ,does it can be made by Petrel 2 and Nerd 1 with 5 pin conection (digital), or Nerd must be with 4 pin (analog)…maybe with some type of digital-analog adapter? Hi, Ivan. You’ll have to direct your question to rEvo. We are not authorized to modify rebreathers ourselves and rEvo will be better prepared to provide you with options. Anyway I can connect the Dive can HUD at the same time as the NERD2? Hello, Paul. You would need to refer this question to JJ. The will be able to give you a better answer to your question.